Some authorities claim that the ancient Malay hero, Hang Tuah, was not a Malay at all, but sprang from humble proto-Malay and sea Gypsy stock. 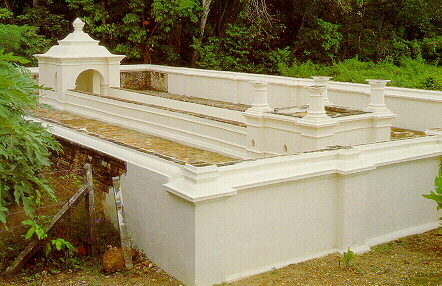 But whatever his origins, it seems that his heart was Malay, and his life and legend have become part of Malay heritage. It was in the year 1456, when he was still a young boy, that his adventures began. He and four friends were attacked and pursued by pirates off the coast of Malacca. This was hardly surprising as piracy had always been rife in these waters. What was unusual was that the five young inexperienced boys managed to drive off their assailants. It was this episode which gave the young Tuah his taste for adventure. But he had the good sense to realise that in his next encounter he might not be so lucky. So he decided that he and his friends must visit Adi Petra, the guru of Gunong Ledang. This guru was something of a mystery man, something of a wizard, the descendant of an ancient tribe of weapon makers. But above all he was a master of the arts of fighting. At the time of Tuah's proposed visit, he was an old, old man, and like the old kendo masters of Japan he retired to a lonely cave in the mountains. The five young Malays sought him out and spent four months under his tutelage. He made them study the methods of warriors long dead; he taught them skill with the keris (Malay wavy-bladed sword) and other weapons; and he taught them the basic principles of metal-working. Finally, he is said to have taught them mystics incantations and to have shown them how to make and use magic charms. Legend says that he himself performed some fairly startling and alarming feats, such as changing himself into a tiger to test his pupils' courage and obedience. This may seem a fairly crowded curriculum for four months, but anyway that is how the story goes. As you might have guessed, Hang Tuah became the guru's special favourite, and he revealed to this one boy many secrets not shared with the others. This handing down of secret knowledge and skills to one favoured pupil is a tradition and hallmark of nearly all the Asian fighting arts. The jujutsu and the kendo masters, the karate and the ch'uan fa masters, all had their treasured secrets to be imparted-perhaps a deathbed gift-to a son or to a worthy and beloved pupil. In any event, much later in his career, Hang Tuah himself became the possessor, if not of magical powers, at least of a magical keris. Any man using this weapon became invulnerable himself, and able of course to inflict mortal wounds on his enemies. Perhaps, to modern minds, this seems a pity. With our preoccupation with the underdog, we like our heroes to win their battles fairly, without supernatural aid. But to the traditional Malay, it seemed only fitting that a mighty warrior should have a mighty and wondrous weapon, and after all King Arthur had Excalibur. And in Malaya, certainly, the idea of a magic keris was a popular one. This was possibly because the keris may well have originated as a religious and symbolic Hindu weapon, introduced into Malaya via the Majapahit empireof Java. As such it would carry magical properties invested in it by one of the various Hindu gods. Hang Tuah's magic keris itself came from Java, where the Hindu influence was still strong. 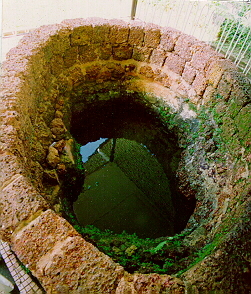 Muslim Malays are reported to have tried to counteract the effect of Hindu magic by forging their own kerises from steel that had sacred Islamic associations. From such a jumble of historical fact and imaginative fictions it is difficult to sift the truth; but it certainly seems likely that the early training which set Hang Tuah on the road to fame was, at least in part, training in silat. Silat is the Malay and Indonesian art of self-defence. It means more or less 'to ward off' and is believed to have originated in Sumatra. Nowadays silat is often thought of as an empty-handed method of self-defence, but as did jujutsu it also teaches the use of weapons. Indeed, silat today might be said to have reached that stage in its development that jujutsu had reached in the second half of the last century, before Jigoro Kano left his stamp on it. For there are still dozens of different 'schools', each following the style and methods handed down by its own particular guru. The difference is, of course, that silat has not fallen into disrepute and is unlikely to do so. Aside from the great number of different styles, silat falls into two major divisions: silat as a serious method of self-defence, and silat as a sport. As a sport it can be sub-divided into two main systems: the formal pre-arranges 'dances' performed at stage-shows, wedding and similar functions; and the actual sporting contests. The divisions correspond roughly to the kata and randori of judo. Some of the steps of the silat 'dances' have wonderfully picturesque names such as lang berlegar tengah hari, 'the hawk circling at midday', which is certainly more suggestive of a fight than, for example, the Chinese ch'uan fa expression, 'the god of thunder climbing a tree'! Of course, as so many different styles of silat are still taught, only pupils belonging to the same 'school' can compete against each other. Otherwise it might well be like pitting a wrestler against a boxer and the result could be dangerous chaos. In some ways silat is similar to karate in that most masters teach their students how to hit using many different parts of the body, and what is perhaps even more important, how to avoid being hit in return. But there is one major difference between the two arts. Silat is not nearly as scientific in attack as karate (for the Malays, despite their magic, never did really discover the vital nerve-centres of the human body) and, therefore , is not nearly as deadly. In this respect it resembles Thai boxing, and as a fighting skill it does have its limitations. But as an entertainment and as a sport it ranks second to none. In the more traditional schools silat is still performed to the accompaniment of Malay drums and other musical instruments-yet another similarity with Thai boxing, although the musical influence is almost certainly from Indonesia, not Thailand. There is, however, in Singapore an active Malay group who practise a new 'modern' form of silat, and this cannot be performed to music at all, as it is more vigorous and less stylised and rhythmic. It is called silat gayyong, which is a little difficult to translate, but the name implies that this form of silat knocks all other forms into a cocked hat. It is also taught in parts of Malaya and there are some teachers who claim that it is not new at all, and that Hang Tuah himself practised it. This seems unlikely, as silat teachers in Singapore claim that silat gayyong has learned and borrowed from both karate and judo. Perhaps the most significant new feature is the 'breakfall' taken from the latter. For in the old days when a Malay warrior fell, he fell, trusting to the hardness of his head and the sofness of his rear to protect him from serious injury. Today things are different, and in the little wooden building which serves as clubhouse and gym young boys and men aged between ten and thirty are carefully taught how to fall. They are taught very carefully and thoroughly, and this is probably just as well because the floor is concrete. During breakfall practice, any number of boys from one to five bend over in line in the traditional 'leapfrog' position. The other boys then vault over them head first. Just before landing the vaulting boys tucks in his head ang take his falling weight on his shoulders. Immediately he rolls with the fall in a complete sommersault and then springs to his feet to assume a traditional defensive stance. For the younger, less experienced boys, a thin landing mat is placed on the floor to help them break their falls, rather than their necks. But the older boys dive into this frightening stunt, and land unaided on the uncovered, unyielding concrete floor. This is the more surprising when one stops to think that even dedicated Japanese judoka use mats in their dojo. As to the contests themselves, these start with the ceremonial Malay salutation, followed by some formal, slow-motion movements which show the form the fight will take (this again is very similar to Thai preliminaries). Silat techniques are divided into groups, and in any one contest only certain groups may be used and this is what is indicated by the formal movements at the beginning of each bout. Sometimes weapons such as parangs (curved knife) and kerises are used, happily usually made of blunted aluminium. Another weapon sometimes used is a long rattan pole, probably introduced from India. Official silat contests are usually presided over by three or four judges and a time limit is set. But there is no standardised contest form as yet. As in karate or judo the combatants are awarded points, but must not actually hurt each other. Perhaps one of the most curious aspects of silat is a sort of medieval hangover, for although the sport is definitely catching up with the twentieth century , many of the old traditions and superstitions still survive. In kampongs in the more isolated areas of Malaya's East Coast , there are still venerable masters who hoard their treasured knowledge for chosen favourites only, and whose pupils form something of a secret brotherhood. Even in modern, bustling Singapore mystery clings to the silat guru. One such, unable to show visitors any pictures of himself in action, explains that friends have indeed tried to photograph his performances, but mysteriously these pictures could never be developed. His friends, reluctantly and perhaps only half in jest, claim that he has magic powers, like the old guru of Gunong Ledang, and bewitchestheir cameras. He claims, defensively, that they are incompetent photographers. Who knows who is right?